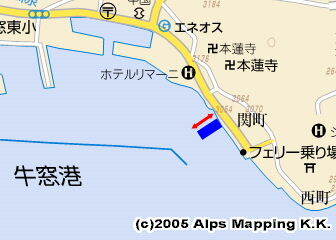 There is a pontoon in Ushimado Old Port owned by Okayama Prefecture. The east one of two pontoons is available. Its west side which is not facing the ferry pier will be more calm for your mooring. You may stay here for a couple of days. 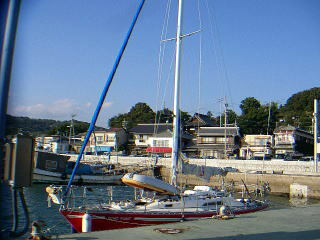 I strongly recommend your mooring at historic Ushimado. Hundreds years ago, the Korean diplomatic corps were always staying Ushimado Old Port to relieve the weariness of their long journey from Korea to Japan. You can enjoy its beautiful and calm cityscape. “You may freely use this pontoon managed by Okayama Prefecture. Water and Toilet at Tourist Information Center. Fuel, Restaurants and a midsized supermarket are near. No shower, no public bathhouse nor coin laundry.